Test Your Skills with the Hoverball Archery Rental! Hoverball Archery is an amazing new interactive game that will immediately engage your guests with a fun and safe competition. 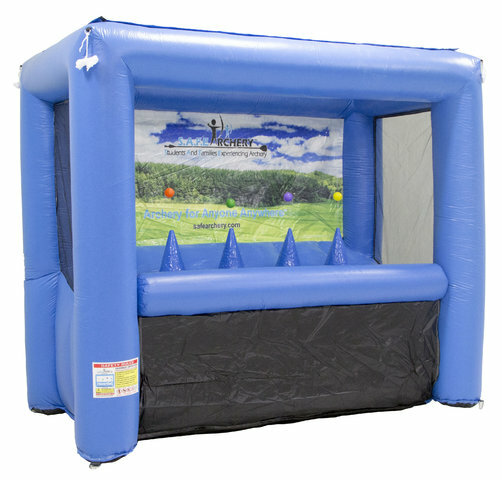 This inflatable interactive archery game features floating targets and safe non-lethal arrows. The soft foam tipped arrows offers the same flight characteristics as a standard arrow yet much safer, allowing opportunities to shoot indoors without the special netting. A fun introducation to archery for a novice, also a fun challenge for the experienced archer. The appealing bright colors of the foam-tipped arrows and challenge of the hover-balls will have children, teens and adults lining up for a turn!